Filed with Belgian charm, this "Brugge" tapestry shows a countryside village scene in Belgium. Brugge is the capital of West Flanders in the Flemish region of Belgium. Sometimes called Venice of the North, this city is beautiful in its use of bridges and villas that are in harmony with the natural surrounds. Here we see the famous canals of Brugges where life on the waterway shows a scene of white swans enjoying the beautiful sunny day. The traditional architecture in the houses and bridge can be seen. 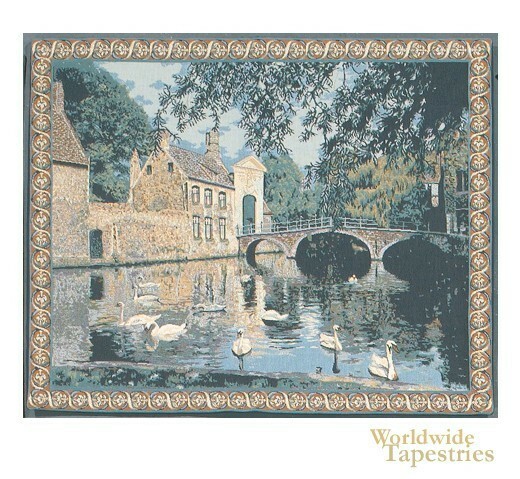 This cityscape tapestry "Brugge" is backed with a lining and has a tunnel for ease of hanging.